We are big fans of the sun-powered Solar Impulse airplane here at Inhabitat, so we were excited to see it officially unveiled to the public during a 20 minute flight at the Paris Air Show. So far we've covered the plane's initial take off, its first flight and its first international flight -- and we can't wait to see what boundaries it breaks next. The one-seater solar aircraft is similar in size to a large plane, but it only weighs as much as a regular car. It is powered by 12,000 solar cells that cover the plane’s wings. They absorb the sun’s energy, and in turn charge batteries that power the 10-horsepower motors that spin the plane’s four propellers. The Solar Impulse proved itself with last summer when it conducted a 26 hour, 10 minute, 19 second flight over Switzerland. Since then it has also flown between Geneva and Zurich in commercial airspace. Click here to see Solar Impulse wowing the crowds at the Paris Air Show. The one-seater solar aircraft is similar in size to a large plane, but it only weighs as much as a regular car. It is powered by 12,000 solar cells that cover the plane's wings. The plane's solar panels absorb the sun’s energy, and in turn charge batteries that power the 10-horsepower motors that spin the plane's four propellers. The Solar Impulse proved itself with last summer when it conducted a 26 hour, 10 minute, 19 second flight over Switzerland. Since then it has also flown between Geneva and Zurich in commercial airspace. 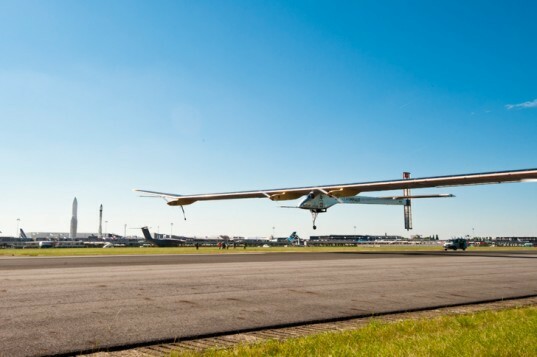 Click here to see Solar Impulse wowing the crowds at the Paris Air Show. 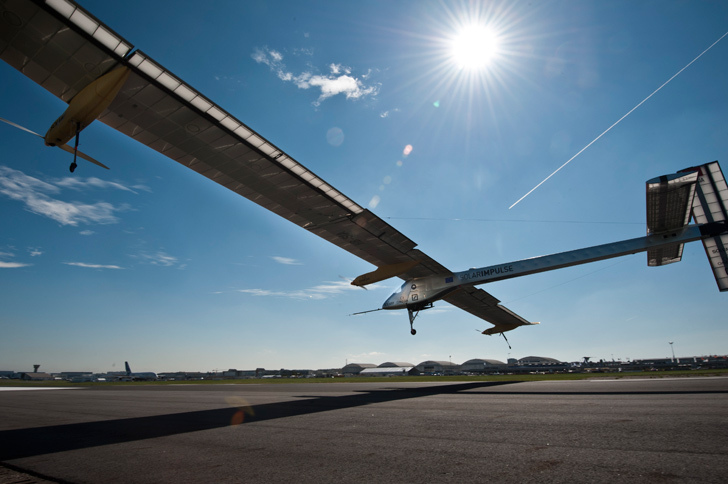 The Solar Impulse soars through the skies using renewable energy. The one-seater solar aircraft is similar in size to a large plane, but it only weighs as much as a regular car. It is powered by 12,000 solar cells that cover the plane's wings. They absorb the sun’s energy, and in turn charge batteries that power the 10-horsepower motors that spin the plane's four propellers.